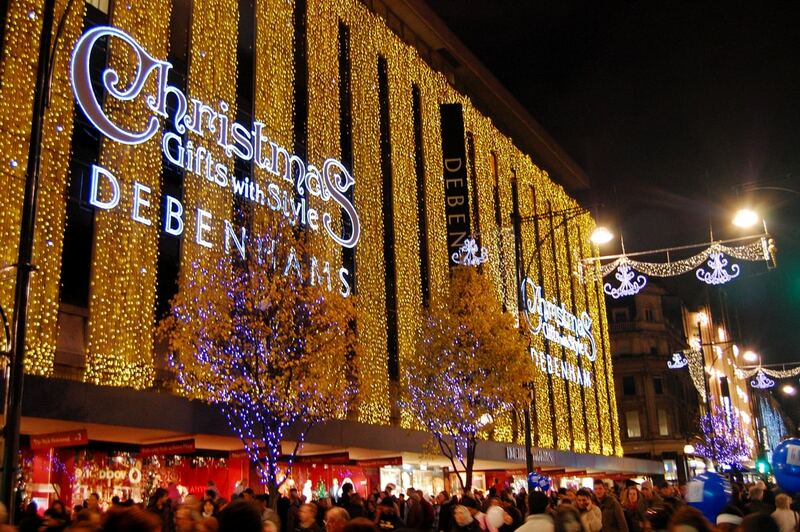 Why not enjoy the festive season with a Christmas shopping experience in London, appreciate the atmosphere whilst buying Christmas presents for your loved ones and maybe treating yourself. The Christmas illuminations around the city make it magical as well as the creative displays shown in the shops. Everything about London at Christmas time makes it a truly unforgettable experience, with Christmas songs playing in the shops, it’s also a great place for a sing a long whilst browsing the shops amongst everyone whose getting in the mood for the season of giving. So why not make your Christmas shopping experience in London a very special one and spend your day shopping in style whilst being driven around the city to all of your favourite shops by an exclusive London chauffeur. Take the stress out of using the busy public transport in London and having the carry your numerous shopping bags as well as the added complication of finding city parking. Oxford Street– A renowned shopping must in London, there’s something magical about the atmosphere in Oxford Street at Christmas time. The famous street is filled with Christmas light displays and wherever you turn you’re sure to see an enchanting sight. Home to a range of popular department stores and close by to Berwick Street and St Christopher’s Place, where you’ll also find unique boutiques and restaurants, which are perfect for a shopping break. Selfridges– Known as the hub of Oxford Street, its mass size means it needs a space of its own! The shop’s famous Christmas displays are a must-see when visiting London at Christmas time. With a range of stylish and luxury gifts that you’ll find nowhere else, Selfridges is a must. Fortnum and Mason– Also known for their amazing Christmas displays as well as their exclusive Christmas hampers which make a perfect gift. There’s an extravagant hamper to suit every personality and taste, including a gluten-free hamper, as well as some delightful personalised gifts. Hamleys– A famous toy shop in Regent Street, this is a must, just imagine Christmas without toys! When you enter this magical toy store you can show the younger ones of your family the love this Christmas. The selection of toys in Hamleys is extensive meaning you’ll be spoilt for choice. Harrods – As everyone knows, Harrods is a must visit when it comes to Christmas shopping in London, the lights are breathtaking and their own dedicated ‘Christmas World’ is one of the biggest Christmas shops in London. What would Christmas shopping be like without seeing the Christmas lights, Oxford street is known to have one of the most extravagant lighting displays at Christmas. Another popular stop is Regent Street, this is the place where the Christmas lights tradition started in 1954 and is known for its mesmerizing display. Bond street is also a popular spot when it comes to admiring the Christmas lights. What better way to enjoy the beautiful sights than from the comfort of a luxury car, chauffeured by a professional. Should you be interested in private drivers for your Christmas shopping trips, Hackett and Hackett have you covered, for more information or to book, call the team today!